Little Ilenie and Big Brett - two unusual couch potato friends. Photo by Michelle Day. I know I must be out of my mind to bring a kitten into a home with three dogs. Kokopelli, a three-month-old kitten, joined our clan less than two weeks ago. Let me introduce the others. First is our pound puppy, Clancy, a nine-year old Sheltie/Beagle/something mix. 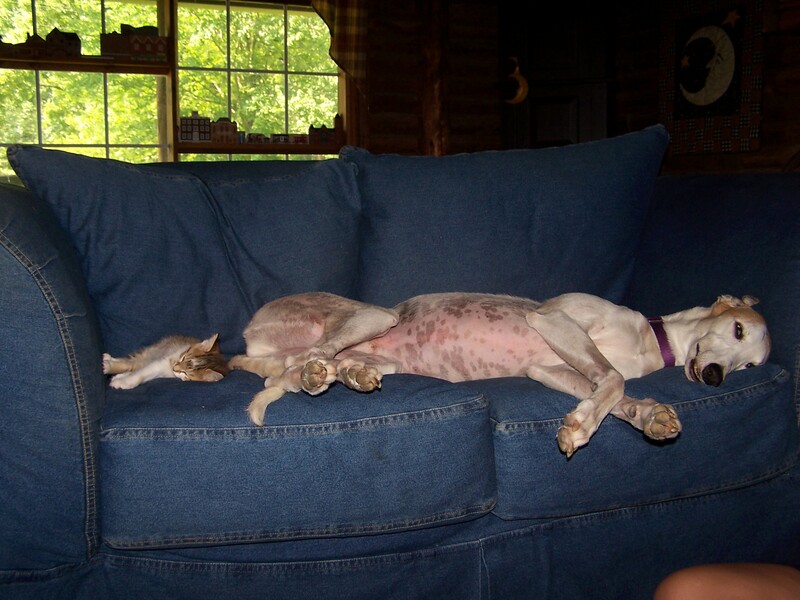 Chaco is a five-year-old retired racer we adopted two years ago. Our newest retired racer is three-year-old Cheyenne who’s been with us for four months. Because there is a lot of misinformation about Greyhounds and cats, I thought this would be an ideal opportunity to talk about how to mix the two. The keys to successful dog/cat relationships are management, patience, supervision, and careful planning. With the right approach, even some high-prey Greyhounds can learn to live peacefully with cats. The first step is to evaluate the temperament and personality of your dogs. What training do your dogs have and what will they need? A reliable down/stay is essential. The better trained your dogs are before you introduce a small animal, the less you’ll have to resort to corrections or punishment to prevent trouble. When you’re bringing a cat or kitten into your home, you have the responsibility to your dogs and the kitten to make it a safe and pleasant experience. So train early and often. If your dog seems to have a really high-prey drive, ask yourself if you’re ready to commit to this challenge. If your dog has had no experience with a cat, try to evaluate her reaction so you know what you’re facing. Take her to pet stores and watch her reaction to toy dogs and small puppies. Walk her past the cat/kitten adoption areas. If you have a friend who has a dog-savvy cat, try an introduction — safely leashed and muzzled, of course. It isn’t fool-proof, but at least it’s an indicator. Don’t count on your adoption group’s evaluation unless it included exposure to a real cat. Many groups rely on reactions to furry mechanical toys that move and squeak. Any dog will tell you this isn’t the same thing. While her reaction to prey is important, so are other issues. Does your dog guard her food, toys, chewies, or sleeping spaces? If she does, how are you going to retrain that behavior and/or protect the cat? Don’t forget how curious cats are. You can bet the kitten will poke his nose somewhere where it doesn’t belong. Kokopelli jumped into Cheyenne’s food dishes to play in her water bowl the third day he was here. If she had food guarding issues he could have become the kitten formerly known as Kokopelli before anyone could have intervened. Look at the physical layout of your home and think about the ways you are going to manage the environment to keep your kitten and your dogs safe. Think about where you’re going to put the litter boxes — yes, boxes. Young kittens need to be able to get to boxes easily and quickly or you may find yourself with a housetraining problem. But dogs love to snack in litter boxes — gross, but true. How are you going to keep the dogs out of the litter box? Where can you put the kitten’s food dish so he has easy access but the dogs can’t steal his food? Kittens need a variety of toys to help with their physical and emotional development, but many toys are small enough to present a choking hazard for your dogs. How are you going to manage bedtime if the dogs aren’t crated? Whenever you can’t supervise, you must separate. That means even if you are only going to the bathroom, the dogs and kitten must be separated until you are absolutely certain the cat is safe. Are your dogs accustomed to being crated or can you create a safe room for the cat when he has to be alone? A safe room is my preference. I keep toys that aren’t dog proof in the safe room for Pelli when he’s home alone. Do you want a kitten or an adult cat? Consider the pros and cons of each. A kitten is more likely to accept the dogs readily. An older kitten or cat who has had no experience with dogs or had a bad experience might run every time one of the dogs approached. This can trigger a chase response from the dog. A cat who lived peacefully with dogs is less likely to react fearfully. Kittens tend to make noises that are quite exciting to predators. They are more than a little active and are fascinated by anything that moves — like wagging tails. Chaco is less than amused by that particular activity. A cat can be fed in a high, out-of-the-way place where even Greyhound noses can’t reach. A kitten may not be able to access those areas to get food. Kittens are small and easily harmed. An older cat may have learned some offensive and defensive behaviors to keep out of harm’s way. Consider how the different breeds of cats are likely to fit with the personalities of your dogs. Many people don’t realize that different breeds of cats have very distinct personalities and activity levels. Research cat breeds so you can choose one most likely to fit into your home. If possible, expose the cat or kitten to a cat-friendly dog and watch the reaction. Some animal adoption agencies are set up to accommodate this. Many shelters and animal welfare groups foster their cats — most foster homes have both dogs and other cats. Try to find such a group. Look for rescue or shelter groups who can help you make good choices. If you are getting a kitten, make sure the kitten is exposed to a variety of people and situations — including dogs, if possible. Introducing your new family member starts a few weeks before his arrival. Tune up your training to improve reliability. Decrease the amount of attention your dogs get to below the level it will be when the kitten arrives. That way the dogs will perceive the arrival of the kitten as something that increases good attention. Both cats and dogs use their sense of smell to communicate. If circumstances permit, a few days before you bring your kitten home, take a towel (or similar object) your dogs have slept on to the breeder or foster home and return with a towel that has the scent of the cat. Step 1: Introduce the Kitten to the House — Alone. If possible, bring the kitten home to an empty house. Let him have an hour or so to explore his new digs, find his litter box and his food, play with some toys, and get settled. This will also allow his scent to spread through the house. As soon as the kitten arrives, begin to get him used to being in a harness and on leash. Start with really short sessions (a minute or less) and reward heavily. Work gradually so he learns to accept the harness and leash. If you live alone, enlist the aid of a helper. Step 2: Expose the Animals to each Other — Slowly. Now confine the kitten to his safe room so the dogs can smell and hear him but can’t see or touch him. While the dogs are sniffing at the door, offer the dogs really, really great treats. Have someone do the same with the kitten. If the cat is frightened, offer the treats further from the door. Make the presence of the other animal a good thing. When everyone is comfortable, prop the door of the safe room open about an inch. Use doorstops (and leashes if necessary) so the dogs can’t push their way in and the kitten can’t get out. One by one let the dogs and kitten see each other and get almost nose to nose if they’re ready. Don’t go any farther until everyone is calm and the cat shows no sign of fear. Open the door a bit further, but make certain the cat can’t get through the opening. Continue to reinforce calm behavior (from both the cat and dogs) with really special treats, praise, petting, and toys. After the kitten is comfortable with the sounds and smells (this could take minutes or days), confine the dogs to the area (after you’ve secured the litter box, unsafe toys, and the like) and let the kitten roam the house again. Now you’re ready to introduce them face to face. Introduce one dog at a time. Confine the other dogs or have someone take them away from the house. Leash the dog and the kitten. Put the dog in a down stay (with someone holding the leash or tie the leash to an immovable object). Bring the kitten into the area, but keep him far enough away that no one is fearful or overly excited. Begin rewarding calm behavior. Gradually bring them closer until they can get nose to nose and remain calm. This is easy while the cat is being cautious. As soon as the cat decides it’s safe to move about or play, things get more interesting. Put the dog in a down stay while she watches the cat move about the room. Reward and praise her heavily. Use petting and praise to calm her. Do the same with each dog in turn. When all the dogs are capable of behaving calmly, repeat with all dogs present. Gradually allow more interactions and don’t forget to reinforce good behavior. How long will it take to incorporate the new family member? It depends. It’s important not to rush. Because our kitten is confident and lived with a dog, two of our three dogs had lived with a cat, and our dogs are reasonably well trained, we were able to progress through the introductions in less than an hour. However, you have to be prepared to take it as slowly as necessary. You can use these steps to introduce your resident cat to a new cat or kitten as well. Some tips to make life easier. Avoid holding the cat above the dogs’ heads. This tends to stimulate prey drive. When the cat’s been away for a few days (for hospitalization or boarding), watch them all carefully. The dog may react very differently to it when it returns and they may need to be reacquainted briefly. Three’s a crowd. One dog may be safe alone with a cat, but it may be lethal to try it with multiple dogs, especially if any of the dogs has shown even moderate prey drive behaviors toward the cat during introductions. Dogs will often pack when something initiates a prey response. Never leave a kitten of any age home alone with any dog. Spare the rod. Don’t rely on punishment. If used too often it causes the animal being punished to associate bad things with the presence of the other animal. If you are relying on punishment, it means you’ve rushed through the introductions, and/or you aren’t adequately supervising and separating. Don’t discourage swatting. If the cat swats at the dog when the dog gets too curious, don’t scold him. Don’t allow the dog to escalate her behavior. Have the dog sit or lie down instead. If you must punish, punish remotely. If the dog chases the cat, use a remote punishment like an air horn (not a great idea with multiple animals since all animals are punished), a squirt gun, or a remote control citronella collar. If you punish, it must occur as close to the beginning of the behavior as possible — preferably when the dog is about to chase rather than after she is already chasing. Any punishment must be followed by an opportunity to be reinforced for a behavior that is incompatible with chasing, such as a down stay. Don’t be afraid to start over. If the chasing continues, back up in the introduction process and work through the process more slowly. Do more work on reliable responses to down and stay. Use a leash to manage her so she cannot chase the cat. Most of all, have fun. We are! Lee Livingood is a professional companion animal trainer and writer. She focuses on teaching household manners and problem solving using positive reinforcement and related motivational techniques. She calls her style of training Win/Win Learning. She does seminars and workshops on the use of positive reinforcement in training and is the author of Retired Racing Greyhounds for Dummies, Howell Books. I found a cheap way to allow the cats to go through but not the dogs. The baby gate is placed high enough on the wall, say 4″ off the floor, so the kitties can get under the gate but the dogs can’t. Curses, foiled again! LOL. There are gates available that have kitty door in them. (I found mine at Fosters and Smith online) This way, your new kitty will know that there is a safe spot to nap and eat. The gates are available in extra tall for greyhounds and other large dogs.